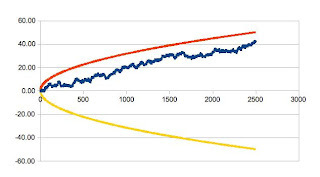 More Grumbine Science: Is climate a random walk? Let's pick up again the discussion between Tamino and me. He has objected to my use of cumulative sums on the grounds that cumulative sums of random numbers have bad behavior statistically. He's correct about that statistical point, naturally, which means caution is needed regarding the statistical part of my post on finding a climate normal. But how concerned should we be as climate scientists? Crucial to that concern is that climate be, to a fair degree, experiencing random variation. It isn't, strictly. As Tamino mentioned, there is certainly a trend in more recent years -- not purely random variation. His criticism is more one against the cumulative sums method. As Jim Bouldin mentioned in the comments recently, we do routinely transform variables in order to study topics of scientific interest. In his case, plants. I'll start by showing you an illustration of why Tamino is concerned. This is a plot of the cumulative sum -- of a purely random variable, with uniformly random numbers in the range plus or minus 1 degree. This is actually about 10 times too large for climate. So the late period value of 40 really means 4 degrees. Each tick mark is 1 month, but assumes that each month's random number is completely independent of each other. That isn't the case, as Tamino has documented. This curve manages to accumulate its 4 degrees in about 200 years. Er, it accumulates that climate wandering in only 200 years!. That and the smooth curves, suggest why we cannot take climate to be random wandering over long periods. Volcanoes suggest why we cannot do so for short periods either. Intermediate periods might be ok physically. The upper and lower curves are growing proportional to the square root of the number of months. Random walks are known to do this. We can't tell whether such an accumulation will head for the warming or the cooling side, but we can be confident that over time, the cumulative sum will move away from zero. I've loaded my spreadsheet for this in Open Office and Excel formats. I do encourage you to pull one of these down, or write your own, and look at a few dozen examples of what can happen with cumulative sums of random numbers. As Tamino said, you can find all kinds of interesting results -- that have nothing to do with anything meaningful. Let's go back to that 4 degree accumulation in 200 years. That's gargantuan compared to real climate changes. The 200 years comes out partly because of the nature of randomness used in my spreadsheet, so don't be too wedded to it. It could easily be more like 2000 years with a better approximation to climate's random nature. I'll hope that Tamino or one of my more mathematical readers take this part up. The other thing is, the accumulation is unbounded -- wait long enough and any limit you put, 4 C, 20 C, 100 C, ..., will be passed. It will take about 25 times as long to pass 20 C warming or cooling, so maybe as fast as 5000 years!? Regardless, however, of the exact period, the random walk is quite happy to move away from a reference climate by 4 C in a pretty short period. Ok, long compared to how long I expect to live. But quite short compared to the 100,000 years or so of an ice age cycle. Global mean temperatures change by about 5 C in an ice age cycle. So this 200 (or 2000?) year accumulation of 4 C is enormous, and fast. But we don't see that in the ice age records. Temperatures cool by about 5 C going in to an ice age. It takes a while. The thing is, we don't see global warmings and coolings of several degrees occurring routinely each few hundred or few thousand years. We don't see 20 C changes at all. What we see instead is that there's a more or less smooth cooling going in to an ice age, and a more or less smooth warming coming out of one. There are occasional large shifts in regional temperatures (the Younger Dryas, for instance, coming out of the last ice age). 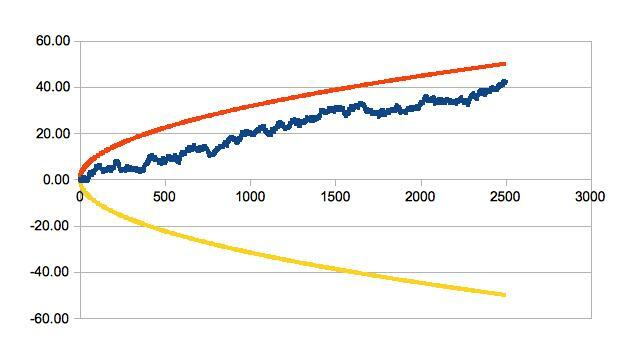 But there are never such large temperature shifts as the random walk looks to expect. The reason is, climate variation is not a purely random process. This is no surprise, of course, and no surprise to Tamino either. The climate system has an idea of what its reference temperature is. That is, if temperatures are a bit higher than normal, it's more likely that the next change will be a cooling. Not necessarily the next month, due to the autocorrelation that Tamino has mentioned. But sooner than later. -- Unless there's something pushing the climate to a new reference temperature. I'll illustrate this, from data, in a post to follow. It provides, by the way, a different way to look for a period of 'normal climate'. The random walk has no idea whether it is currently warmer or cooler than reference, because there is no real reference. This gives a sense that over long periods (even if we're not exactly sure of what 'long' means -- 200 years in this example) climate isn't really a random walk. Volcanoes let us see this return to reference temperature over short periods. When a major volcanic eruption throws a lot of dust in to the upper atmosphere, the earth cools. This, itself, is highly non-random. Throw junk into the upper atmosphere, cool the earth. Never do we see a warming from it. No surprise there. What follows is the interesting part. Over time, the earth warms back up to about where it was before the eruption. That time is a few years. If climate were just a random walk, after that eruption the earth would be as likely to cool as warm. And a few years after the eruption, the earth could just as easily be markedly cooler as back to its normal. Yet what we see is the earth returns to its pre-eruption temperature. Those old enough to remember Pinatubo (1991) experienced this fact themselves. There certainly is randomness to global climate. If there weren't, we would be able to make perfect climate predictions. On the other hand, the randomness is limited somehow. The climate system does have an idea of what temperature it would be at if it weren't being disturbed by something (volcanoes, El Niño, greenhouse gas releases, etc.) and tends to return towards that. We do want to be cautious about using cumulative sums. They have bad statistical behavior against random processes. We do not have to give up on cumulative sums in studying climate. Real climate is not a purely random process. Since climate does seem to have the ability to tell where its 'normal' is, at least over very short (few year) and long (few hundred? few thousand? years) periods, we still have a chance at locating a 'normal' climate. In respect to that, it is reassuring that the length of time over which the normal climate was found in the original post is 90 years -- not just 20-30. #5 is the almost universal conclusion for scientific discussions. I'll hope that Tamino or others take up the question of what more realistic noise would tell us about climate as a random walk processes. I'll take up a different novel approach to climate myself shortly. Instead of sums, it will be differences. They're subject to problems, just as sums are, but they're different problems. If we get to the same conclusions by both methods, we can be more confident of our conclusions. I think one fundamental reason why the climate doesn't move like cumulative sums is that it simply does not accumulate heat indefinitely. A cumulative sum climate model suggests that the climate still "feels" temperature perturbations that occurred at the beginning of the time series even if it was 1000s of years previously. In reality there are negative feedbacks in the system like the Stefan Boltzmann feedback that cause the climate to resist randomly walking. I think a more accurate cumulative sum climate model would be one with a limited window length (e.g. the previous 20 data values). That way the climate can only accumulate temperature perturbations back in the past a fixed amount of time. The result of this is red noise that oscillates around the mean much more like the real climate. Reminds me of a very long but interesting discussion at my blog about whether global avg temp increase is a randowm walk or not. Tamino also chimed in over at his blog. that Salby seems to be saying some of the ozone trend as well as temperature are actually random variation. Tamino's original criticism of my previous note on 'normal climate' relied on the properties of random series when summed -- cumulative sums of random numbers. Rather than try to come up with a better summation of the randomness, my concern here was merely to consider how well a random walk could be considered to represent climate. The answer, I think you and I agree, is no. See also Bart's links for illustrations of the fact that Tamino also agrees that climate is not a random walk even when considered purely as a statistical matter. Thanks for the links. I like your weight gain illustration. Something which may be at play is some philosophical issues regarding what people are thinking of for a 'random walk'. Randomness can be present (is certainly present in the data, if only for reasons of observation uncertainty) in the system without there being a random walk. From skimming some of the thread you link to and articles from there, this seems to be some of the argument. From the abstract, it looks like the randomness in question is not random walk randomness. Rather, it looks more like "variations for reasons that we're not interested in". The more typical notion of randomness. For the sake of this simple consideration, no the cold ocean does not get considered. It is something that I have in mind in considering that the cumulative sums of atmospheric temperatures have some physically interesting meaning. This also connects to my interest in Hasselmann 1976. That deep ocean is a huge energy reservoir, and has a characteristic time of climate interest -- hundreds to thousands of years. > more typical notion of randomness. Now my head hurts. People use "random" to refer to variations they just aren't interested in? I believe you. I just have trouble understanding how my species thinks sometimes. My description might have been somewhat pessimistic. It's the continuation of the adage "One person's noise is another person's signal." Plus the short step to equating noise with random. I not saying, by the way, that this is the sense that the authors are necessarily using the 'random' in. I haven't read far enough to know, just the abstract. For the purpose of the paper, it doesn't actually matter whether the variations are truly random or merely represent variations due to things not already examined. It is this sense, for instance, that we typically look at pretty much anything in weather. We know that weather is chaotic, and chaos means that it is not random. It is a deterministic process. Just one that the underlying physics prevent us from modeling fully. But, yes, being humans, we do shorthand things, and in many situations equate chaos, nonlinear, random, and noise, even though they are all fundamentally distinct things.